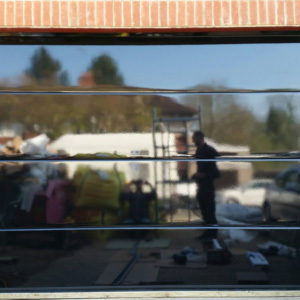 Sectional garage doors - the longest list of benefits. 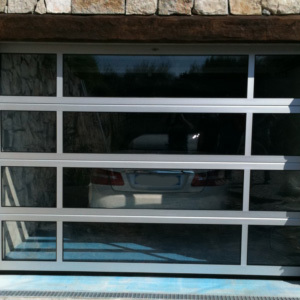 Sectional garage doors combine widest variety of benefits. Think about sectionals at first place when considering which door type to choose. Space saving design means sectional garage doors open vertically. Door panels do not protrude through the opening whilst in operation. Hence space saving feature means that space close to garage door can be functional and utilized. Most of all it is important in situations with short driveways and garages. Our double skinned steel sections are ‘pinch-proof’ and filled with Freon-free PU foam. Ryterna panels give excellent sound and thermal insulation. Garage door U-value ~ 1.1 W/(m2/K) and noise reduction -25 dB. All panel joints are further sealed with rubber seals. All round rubber seal adds to a superb level of protection from rain, snow dust and cold. As a result we achieve excellent protection from the elements. Homeowners install Ryterna sectional garage doors to convert garages space to gyms, offices or storage for vintage cars. Ryterna design sectional doors to fit directly to brickwork. Therefore there is no need for a sub frame when fitted behind the opening. This feature decreases maintenance and adds drive through width and height. 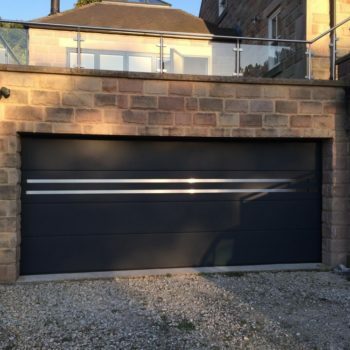 Ryterna sectional garage doors work with an individually balanced counterbalance spring. Springs ensure the door operates with ease no matter whether automated or used manually. We offer two types of springs: tension (R40 models) and torsion (TL models). Tension springs we place along horizontal tracks. There are three options for tension springs. SM – aside, TM – on top, UM – under the horizontal track. 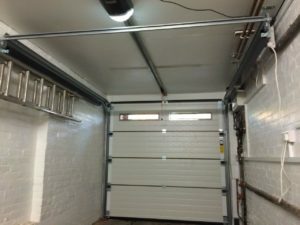 Furthermore we can manufacture sectional garage doors with different tension spring location on each side of the door. It is very important in cases with short side-rooms or side-sloping roof. Torsion springs are on shaft between horizontal tracks. In addition we can place them at front or at rear of horizontal tracks depending on situation. Also we can offer several track types to match your garage situation. For garage doors under the sloping roof we offer tracks raising at an angle to follow the roof line. For complicated situations customer can order individually made tracks. Zinc coated hardware, rollers with high quality bearings and straight forward design ensure smooth and reliable performance. 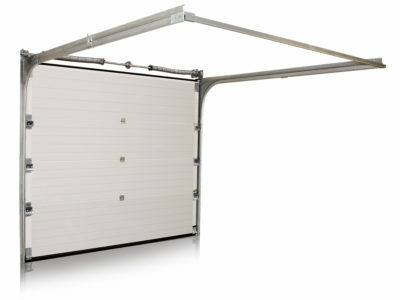 Ryterna make sectional garage doors to order from the smallest to the largest. No standard sizes are kept. 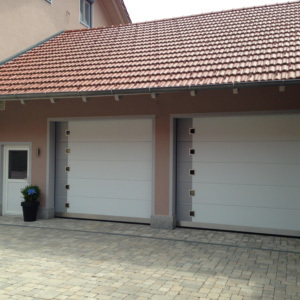 Sectional garage doors have installation requirements such as side room and headroom. These are dependent on the final door size. With flexibility in door size and many track and spring options Ryterna make the door to fit your building in the very best way. Options for further external trims, posts and fascia’s avoid the need for chopping away brickwork or adding timber/UPVC liners. 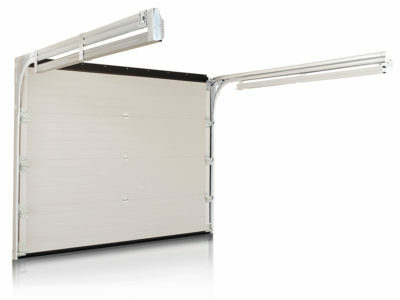 Ryterna also offer aluminium frame system for sectional garage door installation in-between the opening. Maintenance free frames are made to order to suit your opening size. As a standard we supply frame same as door colour. In addition customer can specify different colour. Ryterna’s domestic sectional doors are made up to 8 meters wide by 3 meters high. But upon request sizes up to 12 metres can be made. We offer 14 panel designs which can be painted any RAL or BS colour. Hence you have wide horizons for individual creativity. Even more – smooth surface panels we can paint with a metallic or structure finish. The standard finish gloss level is 20% with options up to 90%. And by combining different colour’s, door panels and stainless steel windows on one door you can create an individually stunning design. 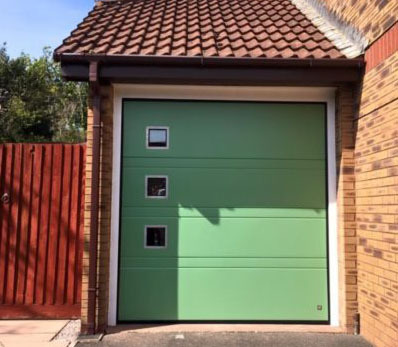 Nothing is easier to match your garage door colour with windows, entrance doors or your flashy car colour. Also 6 painted wood effects and individually designed Okoume timber designs can be specified to compliment any environment. Ryterna have not forgotten the inside of you garage door. Standard internal paint finish is RAL 9002 (Grey White). Upon request we can paint the door inside almost any colour to match. Glazed panels are gaining more popularity. Ryterna can produce door with just the right amount of Glazing to suit your needs. You can order fully glazed door or combination of standard and glazed panels. Glazed doors are perfect choice for hobby space, workshop or vintage car garage. Café or shop owners install fully glazed sectional door instead of front window. As a result you can convert closed space in to the open within a minutes. Even more we offer 5 more exceptional door designs. 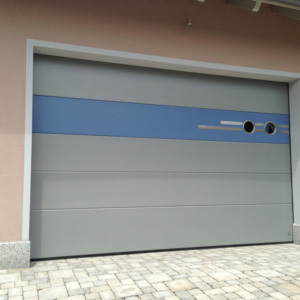 Retro – modern sectional garage doors made to look like old fashion doors. Okoume – 12 or 18 mm okoume plywood cladding with carving or milling custom design. 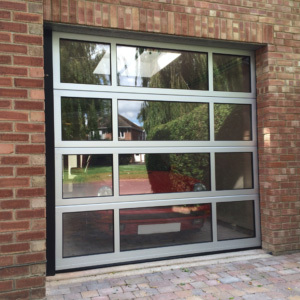 Slim-line – sectional door with narrow 10 – 15 cm glazed panel ‘inserts’ and illuminated with LEDs. 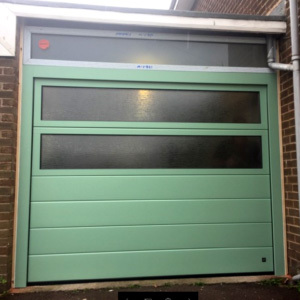 Custom cladding – sectional door panels with bespoke cladding: glass, stone, brass, timber, etc. to match facade. Wicket door or pass door –becoming an incredibly popular option. Hence if use your garage space as a workshop, gym or long term parking this is for you. 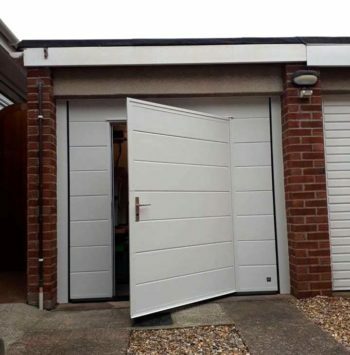 You don’t need to open the whole garage door if you just need to walk through. Ryterna standard wicket door sizes are 800 mm wide by 2100 mm high. But we also offer custom sizes up to 1200 mm wide. Limitations do exist dependent on garage door size. Please consult manufacturer for feasibility. Furthermore you can chose wicket handing side and position. Low threshold will let you pass through without obstacle. It is ‘The must’ option for bikes and bicycles. Ryterna offer many framing solutions. First of all it solve issues with short or missing headroom’s or side rooms. As a result thus avoiding turning to timber and UPVC packers. A clean lined, modern look with a minimum of maintenance Ryterna framing solutions is always the best option. Ryterna sectional garage doors are compatible with all garage door openers. Moreover Ryterna offer a range of ‘Comfort’ operators to match the doors. All ‘Comfort’ operators offer the very best in security, smooth running and reliable trouble free operation. Please clik on GALLERY to look for new ideas and many design.options.